I love cheese- especially when it’s melted. In fact, after I‘ve had too much dessert (i.e. quite often), the first thing that comes to mind is not to back off, but instead, to indulge in some piping hot melted cheese. You know, to balance things out. Naturally, I’m always up for a grilled cheese sandwich. 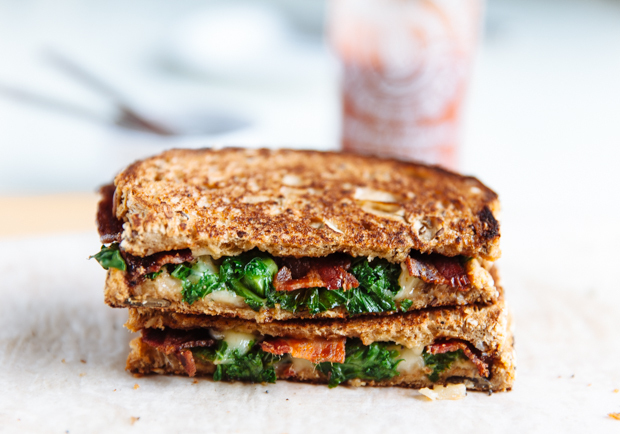 This version is my new favourite combination: there’s subtly smoked soft cheddar and crispy, sweet and spicy bacon. There’s bittersweet kale (again, for balance; oh, how I love balance!) and soft, nutty wholemeal bread. Salty and sweet and spicy, crunchy and soft, it’s all about balance. 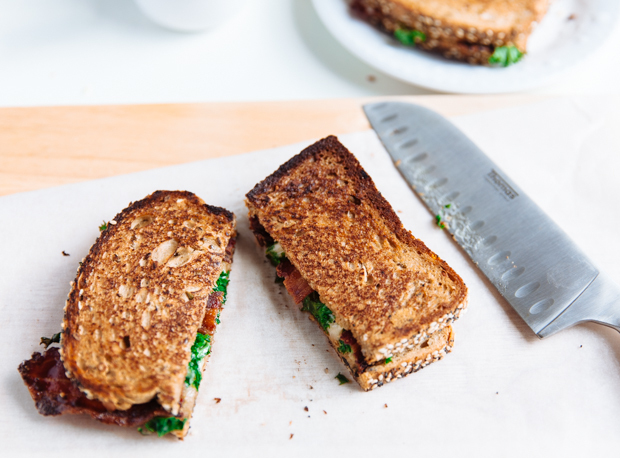 So here is my suggestion: grilled cheese for breakfast, lunch and dinner. All the way. Amen. Turn the oven on to 175C. Make the bacon glaze: combine dark brown sugar, sriracha and maple syrup and mix well. 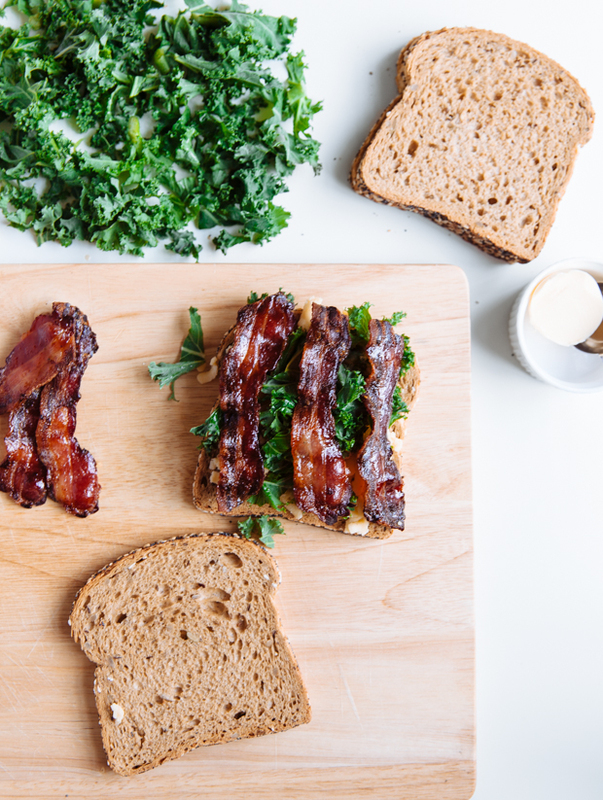 Place the bacon slices on a wire rack and place on a parchment paper-lined tray. Take out of the oven and spread a thin layer of the glaze with a brush. Put back in the oven for 10 minutes. Take out of the oven, flip the bacon and coat again. Place in the oven for 5 minutes, or until brown and crispy (be careful not to burn). Set aside. Melt 1/2 tablespoon butter in a frying pan, over medium heat. 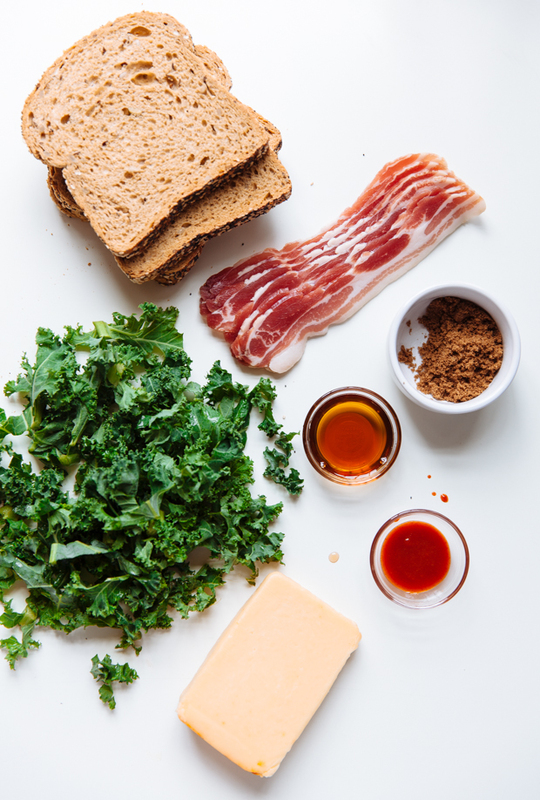 Assemble the grilled cheese: On one slice of bread, add 1/2 cup cheese, about 1/2 cup kale and 3 crispy bacon slices. Top with the second bread slice. Place on the melted butter and cook for about 3 minutes, or until the bottom is golden brown. Flip carefully and cook further, another two minutes. Transfer on a plate and cut in two. Repeat the whole process with the other 3 sandwiches.